You read that right - Libertine (the beer) returns for the fall today at Libertine (the restaurant). Mashed with mounds of Maris Otter malt and balanced with a healthy addition of rye, Libertine's rich palate and 8.5% ABV is just the recipe to take the chill away from these suddenly brisk September days. If you haven't made it to Libertine (the restaurant) yet, you now have even more reason to get there. The mouth-watering menu is full of great potential pairings for Libertine (the beer). Next up: tomorrow at 3:00, we'll start selling tap pours ($5/10 oz pour) and growlers ($18/fill) of Libertine in our taproom. We'll have our friends Drew Peterson & the Dead Pigeons playing live tunes later in the evening, and Sandy's Grill will be parked outside if you're hungry. Finally, we'll be offering Libertine in 4-packs of 12 oz bottles for the first time ever! The bottles will be hitting liquor store shelves later this month -- look for them next to the 6-packs of Sweet Child of Vine, Lonely Blonde, and The Ringer. 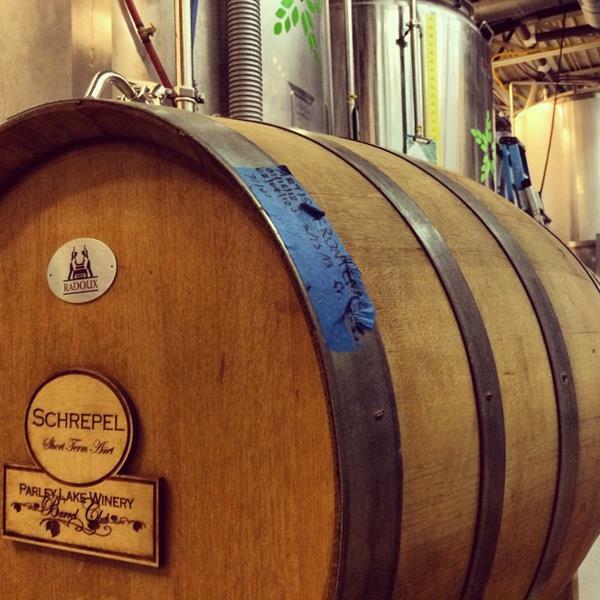 We've partnered with Waconia's Parley Lake Winery to age a very small run of Expat in four different red wine barrels. This is one of the most unique beers we've ever done -- in a very, very good way. The oak and tannins from the barrels blended into Expat's spicy farmhouse notes to create an entirely new beer that's greater than the sum of its parts. Given the extremely small quantity available, Barrel-aged Expat will be draft only and tapped in just a few locations. The first metro-area tapping of this very rare beer will be this Thursday at Parley Lake's winery from 5-9. They'll be serving it for $5/glass while supplies last, and there's even live music & a bonfire. More tappings will be announced on our Facebook & Twitter as they happen, so if you can't make it this Thursday, stay tuned. After two years of subtle and not-so-subtle hinting, we got your message: you'd like us to bottle The Ringer. Now that our new Northeast MPLS brewery is operational, it's finally happening. If you're not familiar with The Ringer, it's our take on the classic American Pale Ale style. It's hop-forward, with bright, citrusy Cascade hop character and a clean finish -- the perfect beer to keep in your fridge, week in and week out. We can assure you that as you finish your first one, you'll channel your inner Walter Sobchak and request another: "Pass me the Ringer, chop-chop!" Look for the 6-packs starting near the end of this month anywhere and everywhere you normally find 6-packs of Sweet Child of Vine and Lonely Blonde.